As the final race weekend at Terre Haute's Crossroads Dragway rolled around, Derick Troxell opted to skip out on racing as other competitors vied for the final points available. For Troxell, the season was already won. 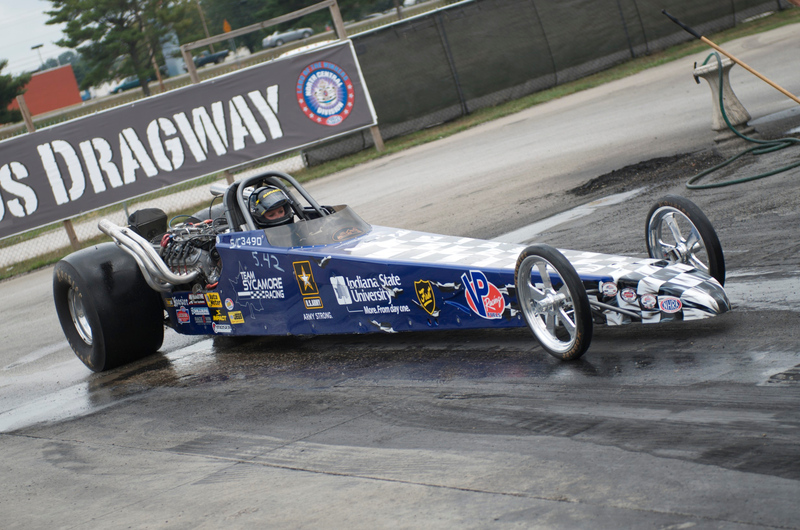 Troxell and Megan Jackson from Team Sycamore Racing at Indiana State University placed in the top three of the season standings for the Super Pro drag racing division at the dragway. Troxell led for most of the season, and finished in first place once the points were reset for the final nine races in a similar fashion to NASCAR's point standings. Jackson, who was racing in her first season in Super Pro, finished third. "I thought it was really pretty cool, because there are some really great racers there at Crossroads Dragway," said Randy Peters, team principal of Team Sycamore Racing and owner of the dragway. "To do this, Derick and Megan had to be very competitive, and very competitive meant they had to get out there each week and perform, and the vehicles had to perform as well." The races occurred on most Saturdays from the spring until late October. They are run in a bracket format, with drivers competing head-to-head until there is only one winner for the day. Racers receive a point for each round they win. In the elapsed time racing in Super Pro, drivers declare the time their cars are supposed to run, which is used to program the starting lights. Drivers then race head-to-head, with the first car to cross the finish line winning. But if the car goes faster than the time the driver declared, the car is disqualified. Troxell and Jackson regularly raced the two cars owned by Team Sycamore Racing. Troxell quickly amassed a lead in the points, and by late September he had won six races, while Jackson had won three. Yet his lead vanished once the points were reset to make way for the final nine races of the year. "It's kind of cool," Troxell said of the reset. "If somebody has a big lead, though, it cuts them back down to where everybody else is, but for everybody else, it levels the playing field." The reset did not seem to make much of an impact. In the races that followed, Troxell amassed such a big lead that he opted out of racing the final weekend so that another member of Team Sycamore Racing could drive the car and fulfill the steps required to get a license to eventually race the dragster. "We had a lot of good competition, but we kept going rounds and getting points," Troxell said. "We did what we needed to do, and came out on top." The competition came down to the final weekend for Jackson. She kept racing after the points reset. Yet it wasn't until another driver - who became her friendly rival - pointed out that they were dueling for second place did she realize exactly how well she was doing. They competed for second place for several weeks heading into the final weekend. They even raced each other on the last weekend, though Jackson lost and ultimately finished third. "We had some car problems, but I ended up making it to the semifinals, which was good," Jackson said of the final weekend, "and I still ended up third place for the season, which is really neat considering it's my first year. I was really happy with the whole season." Prior to this season, Team Sycamore Racing focused on larger divisional races, which occur several times throughout the year. Yet as the team changed its focus to racing nearly every weekend in Super Pro, Peters approached the year with an open mind. "I really didn't know how they would perform," Peters said. "I didn't know how well the equipment would hold up. I didn't know how well our budget would hold up if our equipment failed." The team, which Troxell said received help through the year from his father, Richard Troxell, and Jackson's father, Richard Jackson, has yet to finalize its schedule for next season. Though Troxell and Jackson placed in the top three at Crossroads, they and others are currently going through the application process to be drivers for next year. At the very least, Troxell hopes to compete more in divisional races, which are a level above the Super Pro races at the Crossroads Dragway, in the dragster that he owns, if he doesn't represent Team Sycamore Racing. Team members hope to carry the momentum into next season, and that their success spurs sponsorship interest. At the very least, the season was an unanticipated surprise for Jackson, who had her racing license but was unable to race a full year two seasons ago, which shaped her mindset heading into this year. "I kind of prepared myself to not be able to run a full season," she said, "but being able to run a full season and do well, it just makes me want to get back in there next year." Team Sycamore Racing members and Indiana State University students Phillip Norman, Ryan McCoy, Derick Troxell, Kyle Wilson, Katelynne Reilly and Megan Jackson pose with the team dragsters. Troxell and Jackson, the drivers for Team Sycamore Racing, finished in first place and third place, respectively, for the season at Crossroads Dragway in Terre Haute. Team Sycamore Racing driver Megan Jackson in one of the dragsters at Crossroads Dragway in Terre Haute. 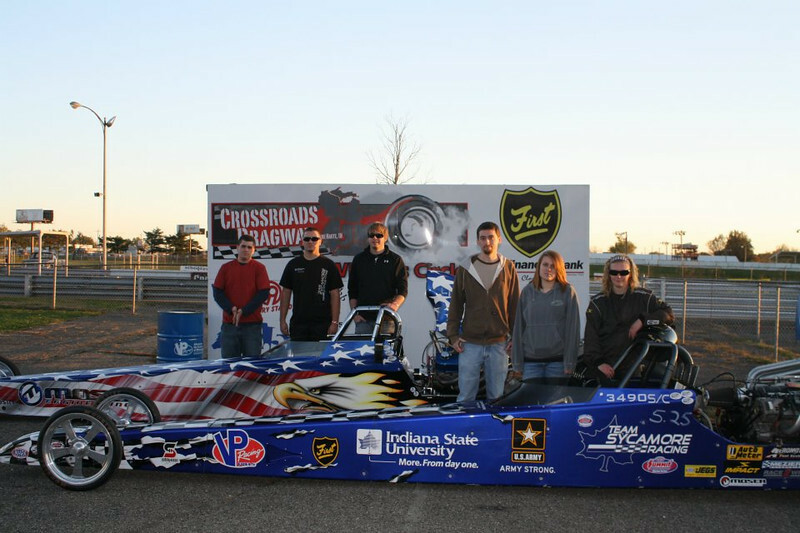 Team Sycamore Racing is Indiana State University's drag racing team. 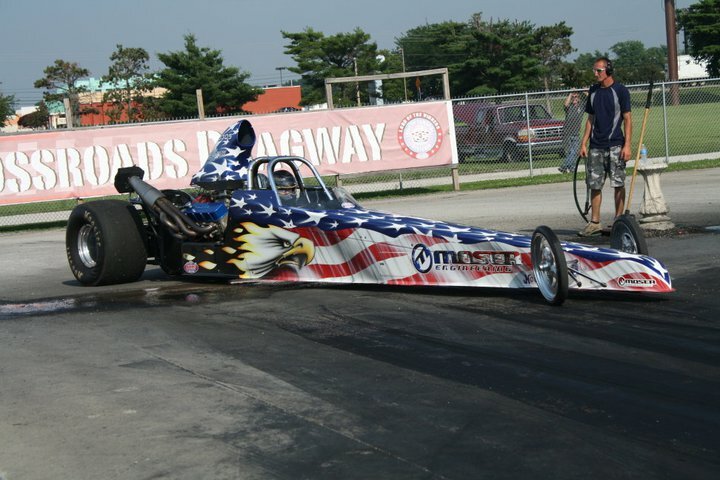 Team Sycamore Racing driver Derick Troxell in the other team dragster at Crossroads Dragway in Terre Haute. Contact: Randy Peters, associate professor, department of applied engineering and technology management, College of Technology, Indiana State University, 812-237-4962 or randy.peters@indstate.edu. Derick Troxell and Megan Jackson from Team Sycamore Racing at Indiana State University placed in the top three of the season standings for the Super Pro drag racing division.